The Texas Dragoon sabers, comissioned in 1839 by The Republic of Texas, were essentially US Model 1833 Dragoon sabers, except that in the place of the standard "United States Dragoons" inscription on the blade, they were inscribed "Texas Dragoons" (makes sense, si?) The originals were made by the Ames Manufacturing Company, and since only 280 were made, they are incredibly rare. 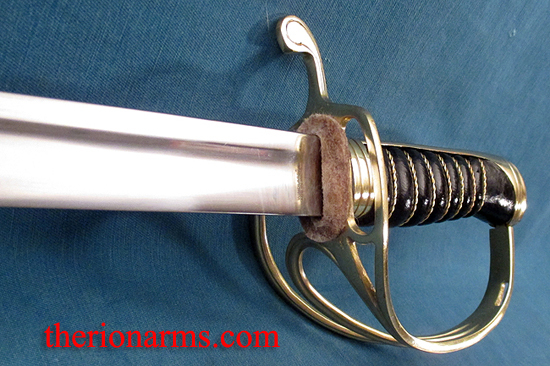 This reproduction has a tempered 1065 high carbon steel blade with a full tang and a quill-backed thrusting spine with a reinforced point, a black leather grip wrapped with twisted brass wire, and a solid brass hilt. 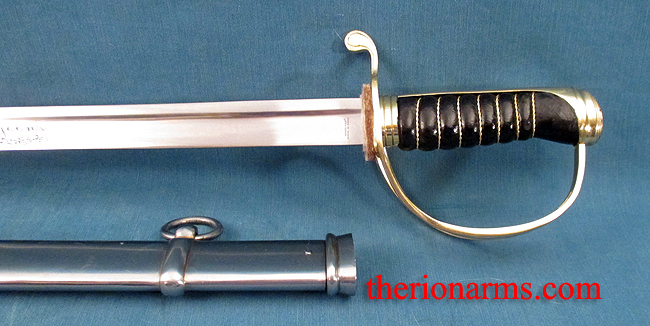 The steel scabbard has twin suspension rings. The 124th regiment of the Texas National Guard were the last horse cavalry regiment in the United States Army, and they recently commissioned TherionArms to have a special version of the Texas Dragoon saber recreated with the regimental designation inscribed on the blade. The good folks of the 124th have picked up all of the sabers they needed but we still have a couple left available, so we are opening sales of these magnificent beasties to fans and the public at large. 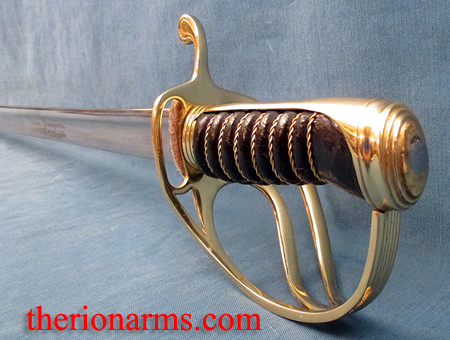 guard: 5" x 4 1/4"
interior grip length: 4 3/8"